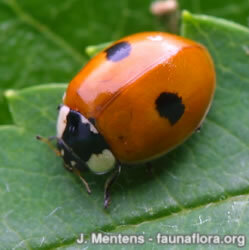 Adult: Body length 4 - 5mm. 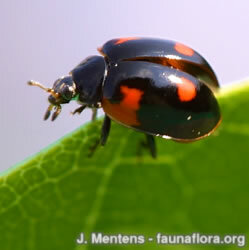 Pronotum is white with black spots, a black M-mark or mainly black. Very variable in colour pattern (background colour and spot number). 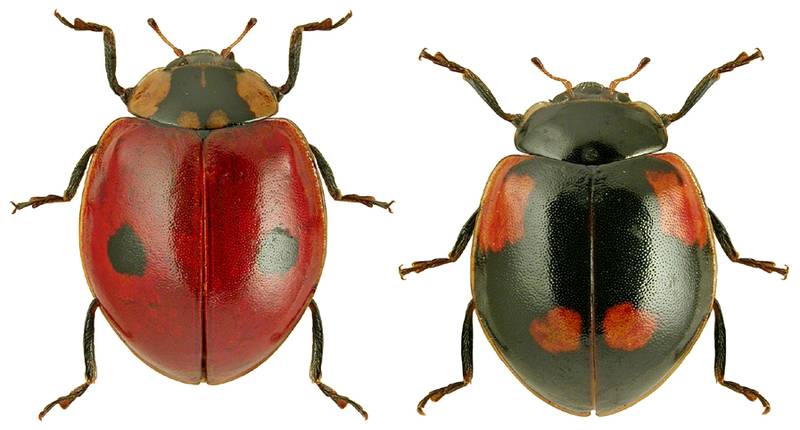 'Typical’ form (typica) is red with two black spots; ‘four-spot melanic’ (quadripustulata) is black with four red spots ‘six-spot melanic’ (sexpustulata) is black. with six red spots. 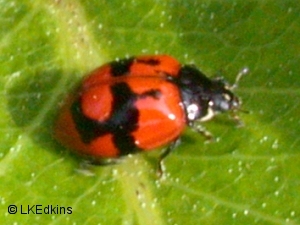 Leg colour is black (a good feature for distinguishing from 10-spot ladybird, which has brown legs). Fourth-instar larva: closely resembles larva of 10-spot ladybird; 2-spot larva is dark grey (10-spot larva is pale grey) with a triangle of orange spots across the first and fourth abdominal segments; outer tubercles on abdominal segments five to eight are dark (pale in 10-spot); fine hairs projecting from tubercles. 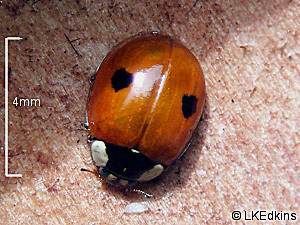 Pupa: closely resembles pupa of 10-spot ladybird; 2-spot pupa has a black front section but otherwise cream with six rows of dark spots running longitudinally (10-spot pupa similar but with a paler overall appearance, two orange spots on edges of first abdominal segment and an orange patch in the middle of segments four to six). 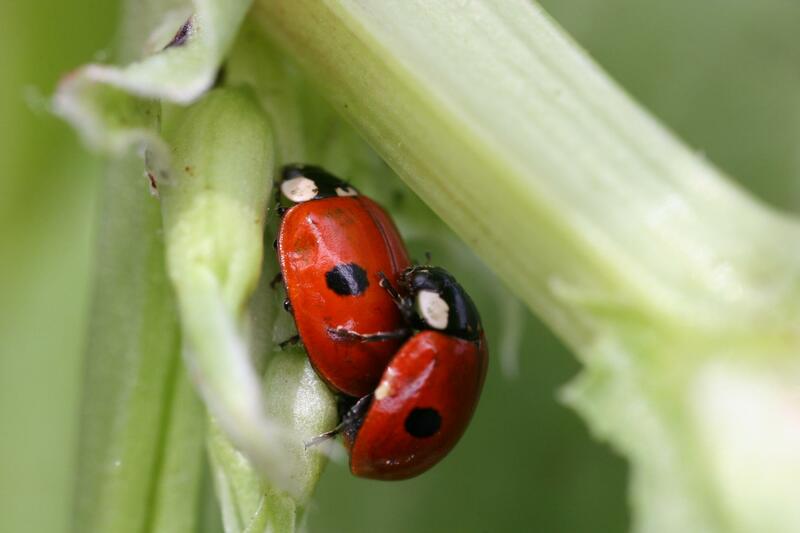 2-spot ladybirds feed on aphids and are noted for occupying very varied habitats. Many 2-spot records are from urban areas where deciduous trees are abundant. This species can be readily found on mature lime or sycamore trees, for example in parks or churchyards. 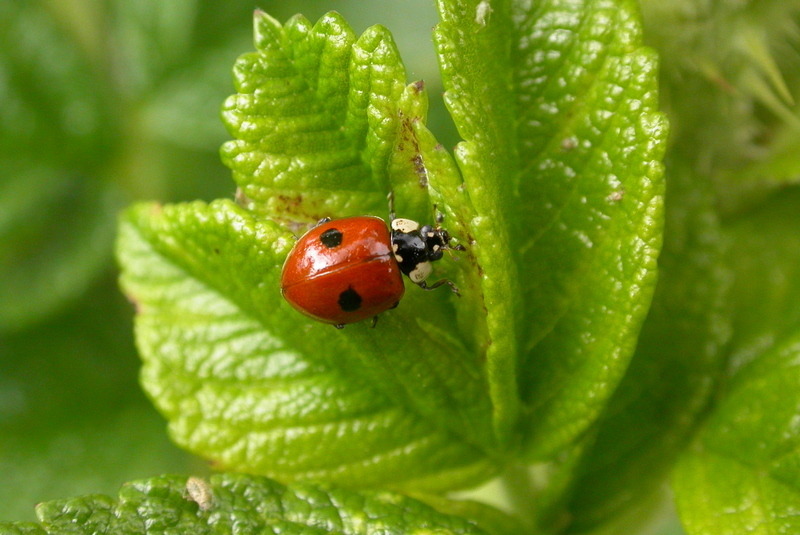 However, 2-spot ladybirds also occupy mature woodlands (both deciduous and coniferous), scrub and grasslands. 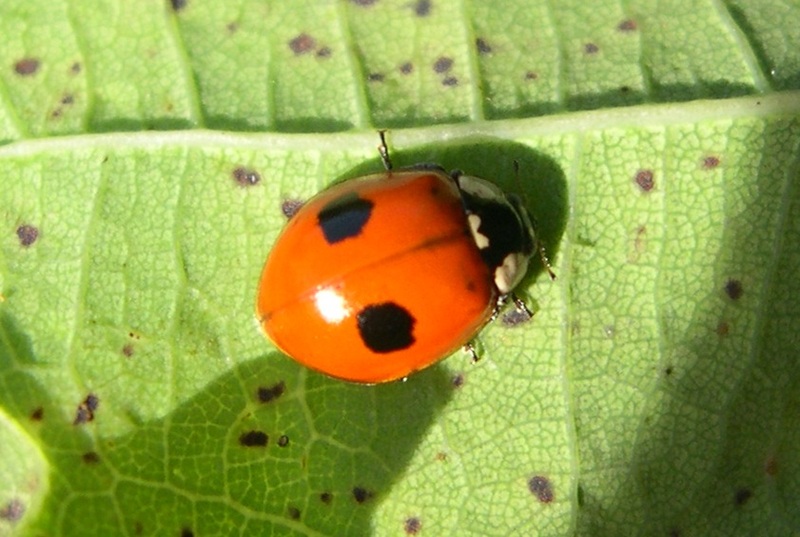 Orchards and crops, including cereals but particularly broad-leaved crops such as field beans, are common habitats for 2-spot ladybirds. There are a number of records of this species from wetlands and coastal habitats, particularly dune systems. 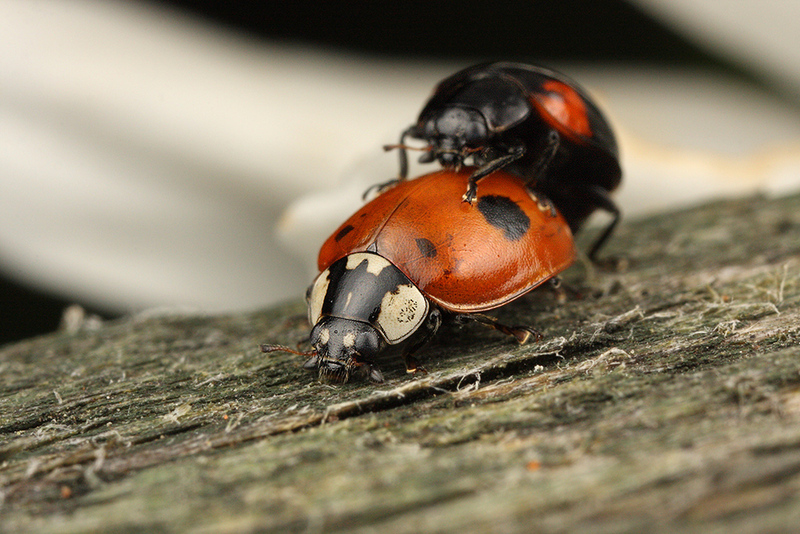 2-spot ladybirds overlap with a number of other species of ladybird and are commonly found with 7-spot, 10-spot, 14-spot, pine and harlequin ladybirds.